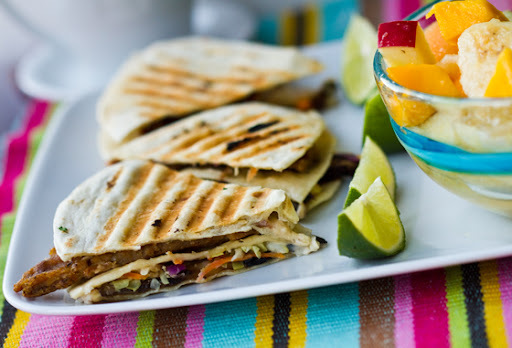 Triple-Stacked Quesadilla, Fresh Lime Fruit Salad, Jicama Slaw! Happy Cinco de Mayo! Like I said before, I'm obsessed with this holiday. So if you thought I was going to leave it alone after my Vegan Fiesta Menu extravaganza - you were wrong. 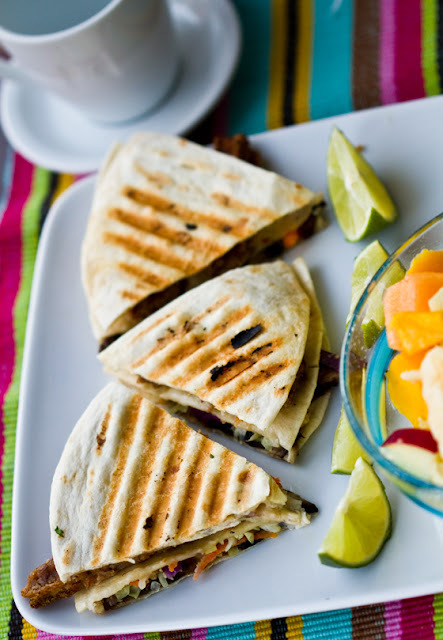 I'm ushering in my favorite food holiday with a Triple-Stacked Quesadilla breakfast. 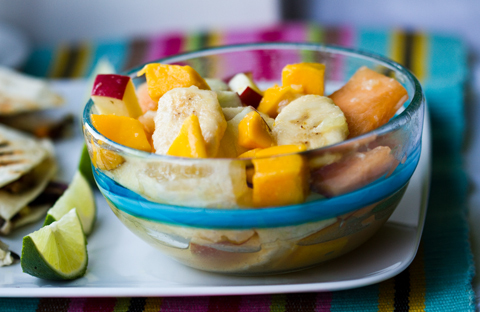 Fresh tropical fruit salad on the side - a Mexican-spiced hot soy mocha on the side. You'll want to get the details on this yummy feast - it's fit for AM or PM!.. 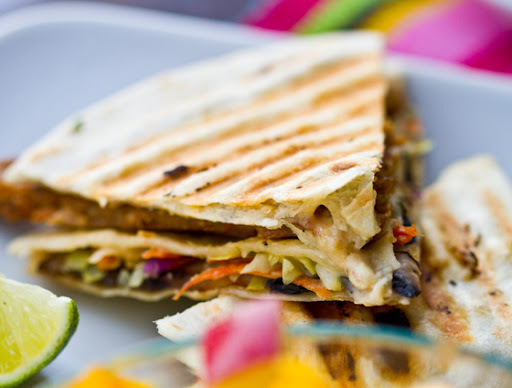 Everyone loves a single-stacked quesadilla, but what about a triple stacked quesadilla? More layers means more delicious filling! As I'm typing this furiously to post in the AM hours, my husband and I are polishing off each yummy triangle bite of this dish. Happy tummy's all morning for sure. Side Dish! 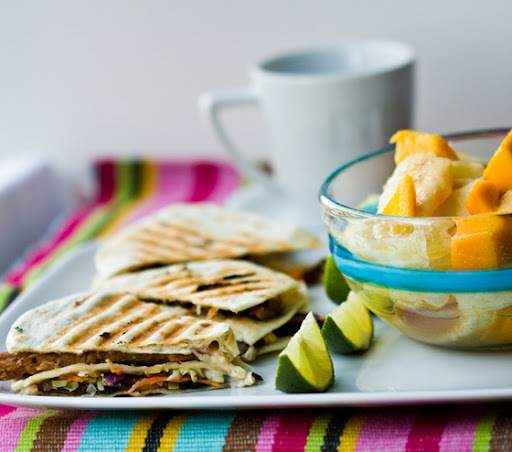 this quesadilla is perfect served with my citrus-infused Fresh Lime Fruit Salad. Check my stacked breakfast out..
1. 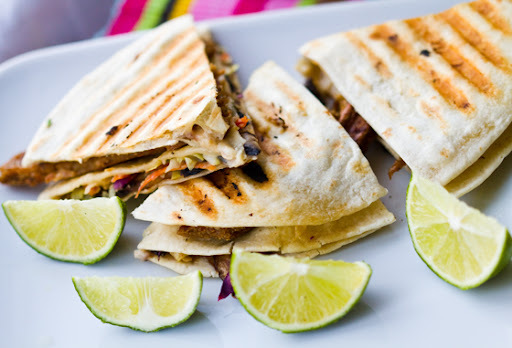 I did this all on my panini press - but you can use a traditional grill pan if you'd prefer. 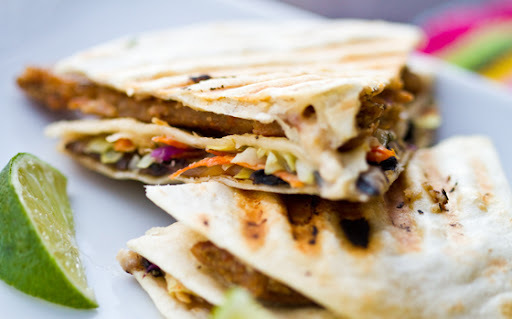 First, prep your ingredients and place the sausage and the mushrooms on your panini press - spray well with oil so they don't stick - for a more decadent quesadilla, add a tsp of vegan buttery spread to the shrooms. Press down the panini press so that you flatten the sausage into a flat pancake an the shrooms are pressed as well. Cook for about 2 minutes. 2. Grab your sliced tortillas. Remove your mushrooms and sausage and add the tortillas - press on grill until warmed. Then the layering fun begins. Add one tortilla, then some cheese, then some shrooms. Then add the second tortilla, more cheese and your sausage (I cut mine into strips for easy placement), also add some hot sauce or spicy chipotle seasoning if you'd like. Lastly, add a pinch of slaw and top with your last layer of tortilla. Use the cheese plentifully to allow the layers to adhere. 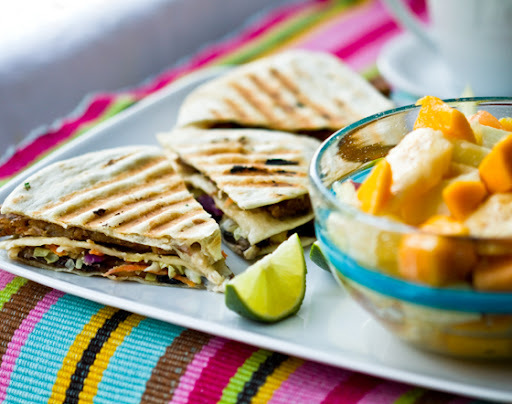 I add a swipe of buttery spread to the tortillas on the top and bottom layers of the quesadilla. 3. 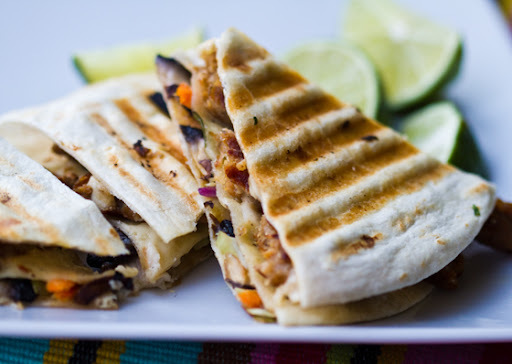 Press down on your panini press again - and cook until toasty - about 1-2 minutes. 4. Slice and serve! I added a fresh lime tropical salad on the side. Recipe below..
Add all ingredients to a large mixing bowl and toss well. Chill for at least ten minutes before serving. Add a few dashes of cayenne and a pinch of lime zest over top for a pretty orange/green-colored accent. 1. Prep all your veggies – I used a mandoline to shred my cabbage and slice my jicama. 2. Combine all the ingredients in a large mixing bowl – toss well. Customize the moisture-level of your slaw – to ‘wet’ your slaw a bit more, add in extra citrus juice. I added in about 1-2 Tbsp extra mandarin juice because I like my slaw a bit on the wet side. Salt and pepper slaw to taste. 3. Chill in fridge until ready to be served.